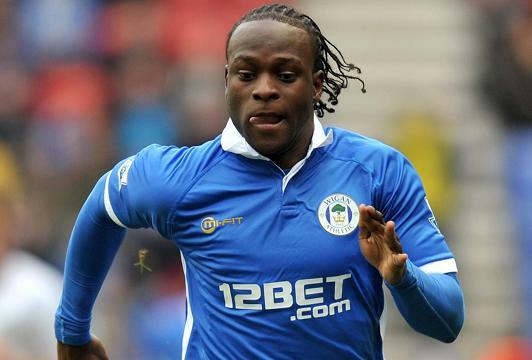 Premier league hot-cake and Wigan playmaker Victor Moses now has Arsenal FC joining Chelsea and Liverpool in their desperate bid to secure his footballing services. Arsenal’s keen interest in Moses is due to the fact that Theo Walcott is still reluctant to commit to them long term. Victor Moses, 21, had a brilliant premier league campaign last season when he was central to his team’s miraculous survival. New Anfield boss Brendan Rodgers has earmarked the Nigerian international as one of his top summer targets, while Moses’ agent says he would prefer a move to Chelsea. But Wigan have resisted all bids for the player – who is out of contract next summer – and owner Dave Whelan has slapped a £12million price-tag on his head. Now Arsene Wenger is ready to emerge as a rival in the race as doubts about Walcott’s future grow. The England winger is unhappy with the offer of a new four-year deal, worth £70,000-a-week. He wants nearer £100,000. That stalemate is still to be resolved and – with only 12 months left on Walcott’s existing deal – Wenger has told the Gunners board to off-load him for anything around £15m. One man right behind Wenger’s tough stance is former Arsenal midfielder Stewart Robson. Namibia 1-1 Nigeria: Obaobona Steps Up For Eagles in Windhoek. New York Knicks Sign Ike Diogu. I want Moses to assign for his own choice of club that, he know that if, he get there he will shine.